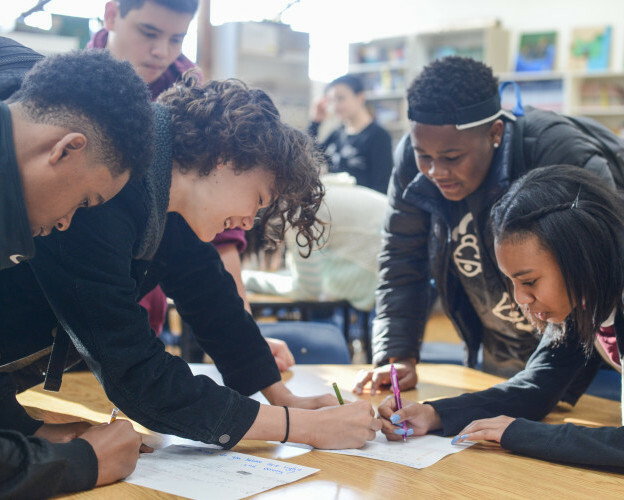 With almost 30 percent of students attending public charter schools in Oakland, the district can not develop a citywide plan without incorporating charter school communities into this work. However, the district’s recent efforts to develop a Blueprint for Quality Schools did not include charter schools, ultimately wasting significant time and resources with an impractical approach that was neither inclusive nor comprehensive. As we begin a new school year, the responsibility for breaking down silos lies with both district and charter leaders, and collaborating to create the Community of Schools work plan is an important opportunity. This month, the Alameda County Board of Education Trustees voted to approve a material revision of Envision Academy High School’s charter to expand its school to include a middle school. Before the 6-1 vote (Trustee Joaquin Rivera was the only dissenting vote), there was discussion about the informal and formal channels of communication between the county office of education and district, and between county-authorized charter schools and Oakland’s staff and district leadership. In the months to come, more charters and charter expansions will come to the OUSD board for approval. We cannot continue to operate in silos. There is too much on the line: quality and equity for our students, budgeting and sustainability issues, and important relationships among our leaders across the district and charter sectors. Solutions to our challenges live within us. 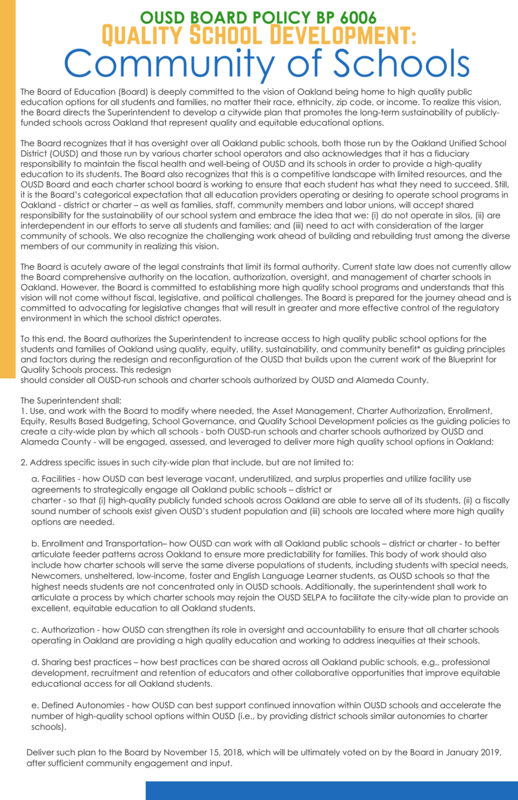 The Community of Schools policy and the opportunity to develop a plan together have the potential to unearth these solutions and over the past week, I’ve heard important recommendations from various Oakland stakeholders for immediate next steps. Set the Table: Our Superintendent and district must set a table and invite charter leaders to engage in the development of the Community of Schools work plan. Our charter leaders must join the Superintendent at the table. Communicate openly: Open communication is critical between district and charter leaders, especially when charter schools are considering expansion. Communication about any expansion or growth would ideally occur regularly for the 2-3 years in advance of rollout. Set a high bar: District and charter leaders must invite families to the table and align around a single plan for measuring school quality. This measure must include schools’ capacity to serve our students who have the greatest needs: newcomer students, students with moderate to severe needs, and students significantly below grade level. These students have unique needs, and also bring so much to the table. 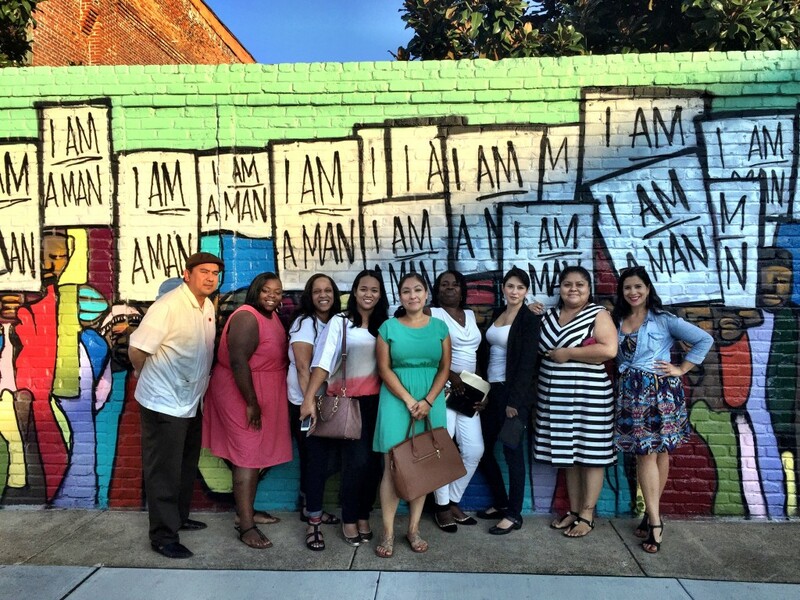 Involve community: Leaders in community and education organizations need to join the effort. This work must be shaped and owned by diverse leaders and representative voices from across our city. Build trust: Lastly, and most importantly, we need to build trust and community. Let’s work to ground ourselves in developing healthy, respectful relationships. We are calling on Oakland’s educators and community leaders to focus on reimagining and building a citywide system of schools. We are asking leaders to take unprecedented responsibility to meet the needs of all students. All means all. If any city can come together across sectors, district and charter, to create something incredible, it’s us. If you agree, share this on social media. We can move beyond battle ground to common ground on behalf of our students. If you are interested in joining the 1Oakland team to be a leader in this work, email Daisy Padilla at dpadilla@gopublicschools.org. If you are an educator and interested in helping our educators shape this work, email Angela Badami Knight at angela@gopublicschools.org. If you are a charter leader or leader of an organization and interested in working in collaboration, email me at mirella@gopublicschools.org.